It's been three weeks since I last blogged. My life has been filled with tiny details, which are not in any way insignificant, although they've definitely drowned my brain. It all started with my birthday. Then we had to prepare for our trip to visit family in Chicago. And before I knew it, Thanksgiving was here. After coming back from the trip, marking the end of November, Cyber Monday (or more like cyber week, actually) crashed through my door, ate all my time and seemed to have dragged my wallet with it on its way out. Amidst all this chaos, only two things managed to keep themselves firmly anchored in my head. So forgive me if these two seem completely unrelated but I feel they're both highlights in their own respect making them worth sharing. Here's a picture of me, mouth wide open, after I recovered from my disorientation and realized that when people screamed "SURPRISE!! ", they actually meant "It's your birthday celebration, you idiot!" Yes, I was a complete idiot for taking at least 5 seconds before figuring out the situation. 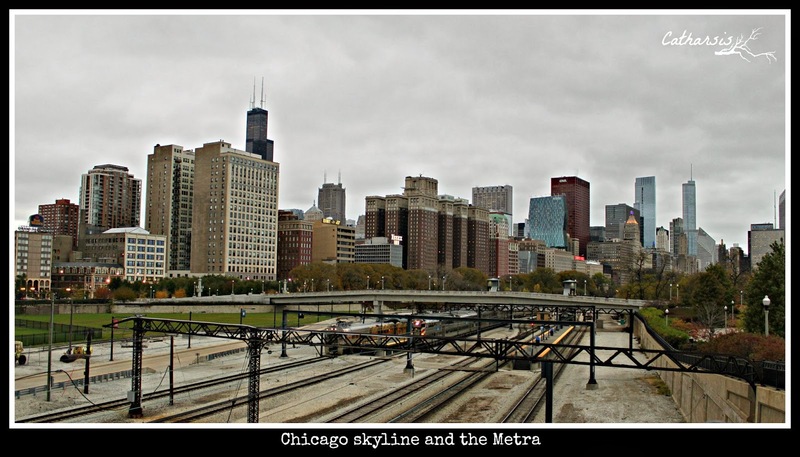 Second, our trip to Chicago was not only spent with family in the suburbs but also had to include at least a trip to the downtown area. I love downtown Chicago. I will always have a soft spot in my heart for it although I've always struggled to articulate exactly why. The closest thing I can come up with is that I have such fond memories of it the way I would of an ex-lover. Only in a very PG way. I suppose it's because I feel like at one point in my life, I had a brief love affair with Chicago and it made such a huge impression on me. It was my first exposure to the US or the American life back in 2001 when I visited as a tourist. I was heartbroken, in limbo, and just badly needed some change...any change. And Chicago gave me all that. With its freezing December air, the layers of clothing I had to wear, the way it allowed me to wear a coat for the first time in my life, how it allowed me to see parts of the city through the 'L'/'El', my solitary walks along the energy of State Street and Michigan Avenue, as well as the more quiet moments I spent on a bench by the lake near Loyola University...all that offered me the distraction I needed. At least for a while. Of course my personal woes did not leave me completely. Those things need way more time than just a holiday break. But I found that something about Chicago comforted me. I guess you can think of it as an extremely short-lived, but exciting fling. It was new to me. Everything was different. It offered enough intrigue and beauty for me to analyze cerebrally, and it most definitely is a city with a lot of character, beautiful architecture, enough for my attention to be sustained. Chicago also offered me the balance I needed in being able to experience a foreign city; highly westernized thus giving me a good glimpse of what it means to be in a first world country, but at the same time, one that is not too 'cold' or unfriendly. But more than anything else, I feel that my fling with Chicago in 2001 offered me hope. With everything that I saw and experienced then, I truly felt a sense of possibility at a time when I felt lost and alone. Yes it sucked walking around this beautiful city by my lonesome, especially when it felt like everywhere I looked all I saw were couples holding hands. But at that time, this city still gave me more than a flicker of hope. It made me feel like there was so much more to the world I can see, so many other possible paths I can choose from, and that's probably all I needed then. My Chicago was there for me when my heart needed opening up. It did not heal me completely. That was a task meant only for me. But it sure did clarify things ABOUT ME that helped me choose where I wanted to be at that time, or what my heart yearns for the most. It was a gift I will forever treasure. So, yes. I will always feel sentimental walking or driving around this downtown area. When I'm in it, I feel like reconnecting once more with an old friend or lover. When I walk its streets, I feel like it echoes back to me some of my private and treasured thoughts and dreams. No, it's not home and I know I don't belong to it completely. But I know it will always be there for me to remind me of of one of the most exciting years of my life, a year replete with 'firsts'. Treasured 'firsts' in 2001, and here I am, 40 in 2013 still experiencing new 'firsts'. Life is good. Life is good, you are so right, Joy, it is a question of attitude, is it not? Great to have a surprise party thrown for you by your family, no matter what age, it is a loving gesture and we should never forget to truly enjoy it. Hope somebody will give me a surprise party for my 100th birthday - can you imagine? I'd rather not! Love the way you write and think about Chicago, some places will always be dear and special for us, in my case it is London.